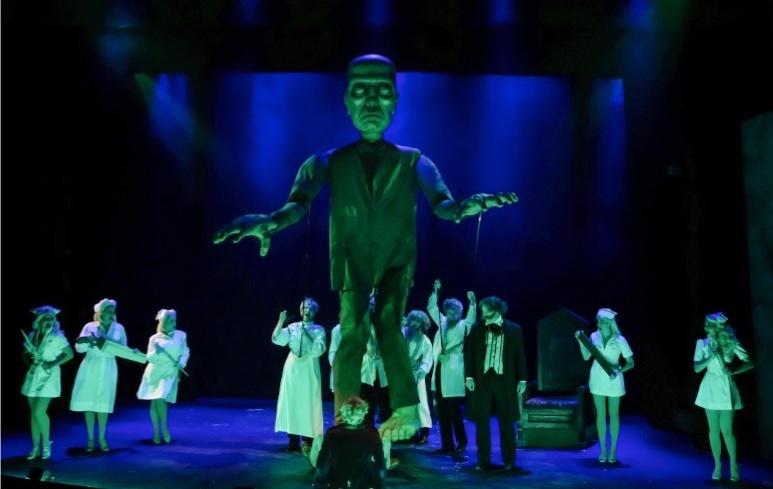 Carol's Theatre Reviews ~ It's Fun To Go Out: No Ghouling About It, SDMT Has A Monster Hit On Its Hands! No Ghouling About It, SDMT Has A Monster Hit On Its Hands! 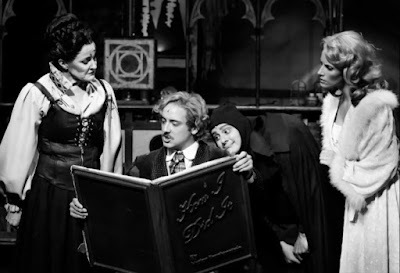 The What is Mel Brooks “Young Frankenstein The Musical” based on 1974 film of the same name mounted by San Diego Musical Theatre. It’s a parody written by Brooks and Thomas Meechan with music and lyrics by Brooks. The 1974 adaptation at the Horton Grand, is a laugh a minute evening. 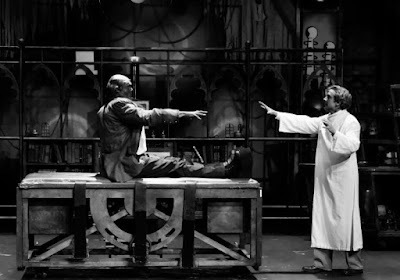 The Who is Kevin Hafso Koppman now marvelously cast in the role of Young Frankenstein and looking eerily like the mad cap scientist he’s supposed to be, Frederick Frankenstein or Frahnken-schteen as he prefers. It’s the role created by Gene Wilder and the resemblance is uncanny (thanks to Peter Herman’s wigs and makeup). Where, is downtown San Diego at the Horton Grand Theatre in the busy Gaslamp district. When is now through Oct. 28th. And if you want some good old-fashioned Brooks shtick, ghoulish looking characters and a “Puttin On The Ritz” dance marathon with none other than…well you won’t to miss Donny Gersonde in his all time funny role as The Monster. But I get ahead of myself…Grr! When the young doctor is notified of his inheritance and is invited to his late grandfather’s family mansion the madness begins. Before that Fred was a renowned scientist in NYC and not too enamored by the family name. Given the job of stealing the brain of a famous historian, he botches that task and eventually brings Frederick a brain of a not so normal brain subject. Needless to say, things get a bit out of hand. 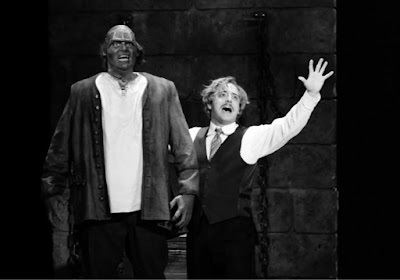 “Young Frankenstein” played for only 485 performances and, at that time (in 2009) the top ticket price was $450.00. It never reached the pinnacle of success that Brooks “The Producers” had. Helping this production along, sans the story, are several factors: The huge sets by Networks and Mathys Herbert are high class looking and serve the production well taking up much of the limited Horton Grand stage space. Janet Pitcher’s costumes are always professional looking and in this particular case fit the characters character to a T.
Several highlights including Irving Berlin’s “Puttin’ On The Ritz”, (mentioned earlier) a classy chorus line number with the cast (including the gigantic green faced Monster) dressed to the ‘nines’ in tails and top hats is a standout. “Transylvania Mania” and “He Vas My Boyfriend” follow. SDMT has been on a winning streak this season and this production is no exception with the casting of Hafso Koppman, the most understated and straight faced/laced of the lot. While the jokes and craziness spin around him, he’s something like the deer in the headlights. It’s as if those propelling the tale are sweeping him into action. A look, a turn of the head or a blank stare into the audience is all that’s needed from him to tell his story. He’s adorable and naïve to a fault especially while both his female followers are pulling him in different directions. His best brain ‘re-vival in centuries, (“It’s Alive”) when the monster springs to his feet sending bolts of electricity through his mad -cap lab, is a riot. Making a surprise appearance, a giant puppet monster is led across the stage and stands right in front of the audience. Everyone stretched their collective necks to get a good look. Donny Gersonde (The Monster) and Troy Tinker-Elliot (Inspector Kemp/Hermit), give it their all. Gersonde as the giant green monster clad in his Elton John like ten-inch platform shoes (even dancing in The Ritz) makes his monster, well, scary in a loveable sort of a way. He is an outstanding monster, if I have to say so myself. Tinker is a hoot as Inspector Kemp with his wooden leg limp and mechanical arm. He’s not so bad as the blind hermit either carrying out Brooks’ shticks of pouring hot soup on to the Monster’s, well, private parts. Kelly Derouin is Fredrick’s Transylvanian love interest. Some might say she is all over him, and of course she is. She is Inga (“Roll In The Hay”) his assistant (right!). And of course we need a Frau (“He Vas My Boyfriend”) and Christine Hewitt is a standout as Frau Blücher. She and Igor are blasts from the past of the Frankenstein ahem, legend and are outstanding. Larry Raben no stranger to Mel Brooks and co. since he starred as Frederick and “The Producers” on Broadway and in Las Vegas directs with a knowledgeable eye and a gift for bringing out the best in his cast. Under the musical supervision of SDMT’s Don Le Master, musical director, Michelle Miles Lighting design, Peter Herman’s Wigs/hair design, Kevin Anthenill Sound Design, David Engels’ awesome and clever projections “Young Frankenstein" hums along in a most entertaining and fun filled evening of ghoulish mayhem one might ever see. Scare ‘um before you calm them and they will clamor for more. Make a date with your favorite Halloween mate. All kidding aside, SDMT has a hit on its hands as the 2018 season comes to a close.